Regan King and Jacob Cowley are poised to make history in Friday's Pro12 derby by becoming the first father and son to play together in regional rugby. The 35-year-old former All Black King starts at centre for Scarlets against Newport Gwent Dragons, while 18-year-old wing Cowley is on the bench. Cowley joined the Welsh region in the summer after moving from New Zealand. "It's been good to train alongside dad and get to know him a bit more," Cowley told the Scarlets website. "It's also been really good to see how good he is at his job and to learn from him." Cowley was brought up in Australia and moved back to Hamilton in New Zealand at the age of 16. He agreed a three-year deal with the Scarlets academy in the summer and has played two games for Llandovery in the Principality Premiership this season against Aberavon and Newport. No father and son have played together since the Welsh rugby regions were created in 2003.However, Keith Colclough played prop for Swansea alongside his son Dean against Bridgend in 1998. At the time they were aged 40 and 19 respectively. Speaking to a New Zealand television station earlier this month, King said he had not seen Cowley play rugby "since he was about 10". The pair now share a house, something King said was a pleasant experience. "It was a good thing really because I've hardly spent time with him and now we get to spend all the time together," he said. "It's a bit different though having someone on the wing call me dad… made me feel really old." King first joined Scarlets from Stade Francais in 2005. 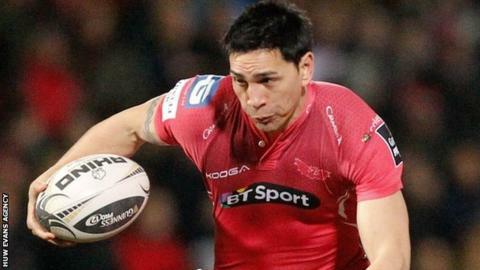 He left Scarlets for Clermont Auvergne in 2011 and returned to west Wales ahead of the 2014-15 season. Cowley is looking forward to joining his father on the pitch. "It'll be awesome just to be in the 23. A lot of boys are hoping to play for this team so it's awesome to get a shot," he said. "It'll be really good to be on the pitch with the old man but also just get out there and have fun."